2/26/19 - CIPR Webinar: Innovating for New Retirement Solutions | Replay now available! 1/24/19 - January 2019 CIPR Newsletter now available! 12/12/18 - CIPR Webinar: InsurTech: Technology and Innovation in the Insurance Sector | Replay now available! 12/6/18 - New additions to Key Issues including Chatbots, Travel Insurance, and more now available! 10/15/18 - CIPR Fall National Meeting Program: Rising Health Care Costs, Key Drivers and Potential Solutions | Saturday, November 17, 2018 | San Francisco, CA | Recap and Audio Recording coming soon! 9/28/18 - The Rise of Artificial Intelligence (AI) in Insurance | Replay now available! 8/20/18 - August 2018 CIPR Newsletter now available! 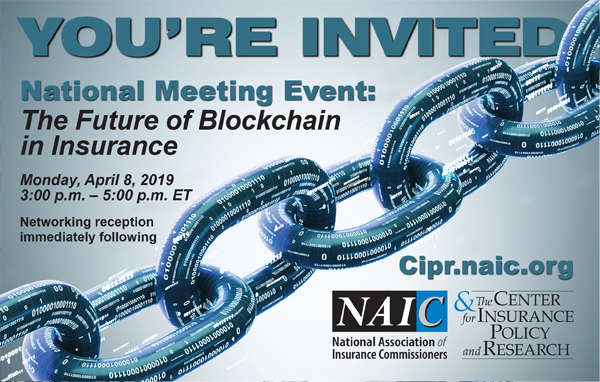 8/7/18 - CIPR Summer National Meeting Program: Can Regulation Keep up with Innovation | Recap and Audio Recording now available! 7/31/18 - CIPR Webinar: Peer-to-Peer Car Sharing and its Impact on Insurance | Replay now available!